Transformational piano composition to help pain, insomnia, addictions, cardiovascular illnesses, and anxiety. 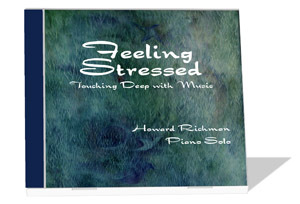 Feeling Stressed: Touching Deep With Music, from Sound Feelings, is a downloadable .mp3 or FLAC intended as an adjunctive, supportive entrainment music for stress release tool to encourage emotional expression, which complements natural healing, treatments and programs for stress reduction, stress management, post traumatic stress syndrome and smoking cessation. This music first reflects the current stress or turmoil and transforms into the desired mood and feeling. See What Others Say about Feeling Stressed. Feeling Stressed: Touching Deep With Music. Music has the distinct quality of being able to touch both the emotional and the physical parts of our being. Each person will respond differently to the Feeling Stressed music. Some people will experience more of an emotional response and others will experience more of a physical response. It has been shown that there is a “mind-body link” between the emotional and physical. This means that certain emotional states are associated with certain physical conditions. Stress has been found to be associated with pain, insomnia, addictions, smoking, cardiovascular illnesses, post-traumatic-stress syndrome, TMJ, panic disorder/anxiety. If the emotional pain is reduced, it could be indirectly helpful for the physical condition. Similarly, if the physical condition is improved, it could be indirectly helpful for the emotional state. See the Uses and Applications for Feeling Stressed. Listening Suggestions for Feeling Stressed. Available INSTANTLY. After you make your payment, you will be given a password which will allow you to download the .mp3 or FLAC version of Feeling Stressed. You will then be able to hear the complete song on your computer. If you prefer, you may use your CD burner on your computer to burn a CD of the song, which you then will be able to play on any CD player. Also, please see our links to other great sites about stress management, addictions, anxiety and panic disorder, circulation, heart disease, insomnia, pain management, smoking cessation, TMJ and sound healing.